"Hello, Colorado chess fans! Another great US Chess Championship just finished in St. Louis and I was able to attend the final two rounds. This has become one of my favorite annual tournaments. The St. Louis Chess Club has hosted each year since opening and once again put on a professional event for spectators live or online. US chess fans should make a pilgrimage once to this great event where you can not only watch the twelve best men and women play up close but also have a chance to meet them. Weeks before this planned trip I had learned that our DCC President Brian Wall turned the magical chess age of 64, so I decided to invite him along for his lifetime of dedication to chess. Eventually, our DCC friends Dwight Sehler and Elena Novik would join us in St. Louis. While I have known Brian for many years, I very much enjoyed getting to know Dwight and Elena and their joy of chess. While many of us just show up to play chess at the DCC, try getting to know some other members as we all have a story to share. I'm sure Tani was thrilled to be a guest at the 2019 U.S. Chess Championship. Before I talk about the US championship, I'd like to share a heartwarming story that has been going viral recently about a young 8-year-old boy from Nigeria. The young Tanitoluwa Adewumi, or "Tani", won the New York State Scholastic Championships for K-3. And he did this by knowing the game of chess for barely a year! The Adewumi family left Nigeria in 2017 and found asylum in New York City. And now chess is changing their lives and they are helping other refugees. The youngster certainly has the look of a chess player. The Adewumi's were invited to St. Louis for a visit to the US chess championship and I had the honor of meeting the entire family and chess coaches from the elementary school P.S.116. Tani was first given a tour of the club where he gazed at the walls filled with famous chess players. Then invited downstairs to play a game with reporter FM Mike Klein of Chess.com and later with champions Jennifer Yu and Hikaru Nakamura amongst others. I was there also to witness his "puzzle rush" skills which were impressive. We made our way upstairs where Tani would make the opening move on the Nakamura and Dominguez board. Tani's Proud parents, Oluwatoyin and Kayode Adewumi. It was an absolute pleasure speaking with his parents, Kayode & Oluwatoyin. Both were very kind and humble about the entire experience. Their other son Austin was there also along with P.S.116 school chess program supervisor Russell Makofsky. I think we'll be hearing about Tani and his family for some time as he aspires to become the youngest GrandMaster. GM Fabiano Caruana at the board. We were there for the final weekend, where round 10 would pair up the tournament leaders. GM Hikaru Nakamura and GM Leinier Dominguez, each with 6.5 points. A showdown between four-time US Champ Nakamura and the newly US federated Dominguez from Cuba would be the main attraction. And with GM Fabiano Caruana at 6.0 points anything could happen. IM Anna Zatonskih has the White pieces against WGM Jennifer Yu. Not to be outdone, on the women's side veteran IM Anna Zatonskih at 7.5 points would play the young leader FM Jennifer Yu with 8.0 points. A win for Anna would give her a shot at her fifth title while a win for Miss Yu would clinch her first title. This is why I try to attend the final rounds, great stuff! The next nearest contender was WGM Tatev Abrahamyan with 6.0 points. She will be playing in our upcoming 2019 Denver Open. We are excited to have WGM Tatev Abrahamyan coming to the 2019 Denver Open. What to watch with so many great games! Anna Zatonskih with the white pieces would press against the undefeated Jennifer Yu. With her seven wins, two draws and her IM norms secured, the young Yu would be hard to beat. After a long struggle and what looked like a possible draw by repetition, Miss Yu found a nice mating combination and therefore won the 2019 US Women's Chess Championship title with a round to spare. As a jubilant Jennifer Yu went downstairs, a great crowd greeted her with thundering applause that could be heard upstairs in the normally quiet playing hall. A triumphant Jennifer Yu. The new U.S. Women's Champion. Turning to the Fabiano Caruana vs. Aleks Lenderman game, a well prepared Fabiano would play against the Petroff Defense. No doubt still having preparation from the World Championship match, he would handily defeat Aleks and put himself temporarily in the lead. Nakamura playing with white would never get any real chances in the game. Dominguez would hold the draw and continue a great performance in his first US Championship appearance. So with that quiet draw, we ended up with a three-way tie going into the final round! The final round Sunday is what I relish about these tournaments. Big pressure chess games like these are where Champions shine. With the women's title already secured, all attention was on the men's side. A large crowd gathered to watch the finale and would not be disappointed. GM Jeffery Xiong accepting defeat at the hand of GM Hikaru Nakamura in this last round game. Last years winner Sam Shankland would play Fabiano Caruana. With queens leaving the board early the game fizzled into a quiet draw. The next game to finish would be Hikaru Nakamura playing with black against the young Jeffrey Xiong who had an incredible start to the tournament. Nakamura would play the Dutch and complicate the position where the veteran would steer the game in his favor. In the end, a king walk up the center of the board along with his Knight and Rook would catch Jeffrey Xiong in a mating net. With a win for Nakamura, his fifth title was uncertain until the end of the Leinier Dominguez vs. Timur Gareev game. All eyes were now on this game. Dominguez was heavily favored playing with the white pieces against the lower rated Gareev. The two had first met and played in the 2006 Olympiad, and the blindfold King would not go down easy. A long marathon game would ensue and with Dominguez getting to the endgame a piece up, it looked as if a tie break game would be in the works on Monday. But Gareev, showing great endgame resourcefulness, held the Knight at bay and made a draw. Thus, Hikaru Nakamura became the 2019 US Chess Champion! Caruana and Dominguez tied for second place. On the women's side, Anna Zatonskih and Tatev Abrahamyan tied for second. WGM Jennifer Yu at work over the board. A great tournament for Jennifer Yu with a whopping score of 10 out of 11 points! And also for Hikaru Nakamura capturing his fifth US title fourteen years after his first. Both were a young seventeen years old for their first US titles. A great finish to a great tournament. GM Yasser Seirawan enjoying a blitz game with GM Wesley So as a spectator looks on. The trio of Yasser Seirawan, Jennifer Shahade, and Maurice Ashley once again provided great live broadcast commentating. And next door the GM duo Alejandro Ramirez and Eric Hansen provided great live commentary which Brian enjoyed very much. After an interview by Mike Klein, fans lined up for pictures and a chance to meet the US champ. Nakamura's second Kris Littlejohn made an appearance along with Sunil Weeramantry, Hikaru's stepfather and world-renowned chess coach. Sunil will be playing in the Denver Open April 26-28. Did I mention how now would be a good time to sign up for the Denver Open! Many people stayed afterward to play chess at the club and catch a glimpse of their favorite players. After an action packed weekend of chess, Monday would be a relaxing day until the closing ceremony in the evening. Dwight, Brian, and I had quite a time not just with chess, but meeting many great people and players there. The beautiful Chase Park Plaza would hold the closing ceremony and provide some great entertainment. A jam packed room for the closing ceremony. A live band each night along with pool tables ran late into the night. We were able to hang out with Timur Gareev and friends one evening and the US champ another. And for you pool sharks out there, Dwight is an excellent pool player! Elena Novik missed the weekend but did arrive Monday for the closing ceremony. So we would all visit the Hall of Fame and tour the latest exhibit, US Chess 80 years. Great history and tradition in US chess we can all be proud to be part of as chess players. GM Nakamura being presented with a very nice prize check, and the Championship trophy. 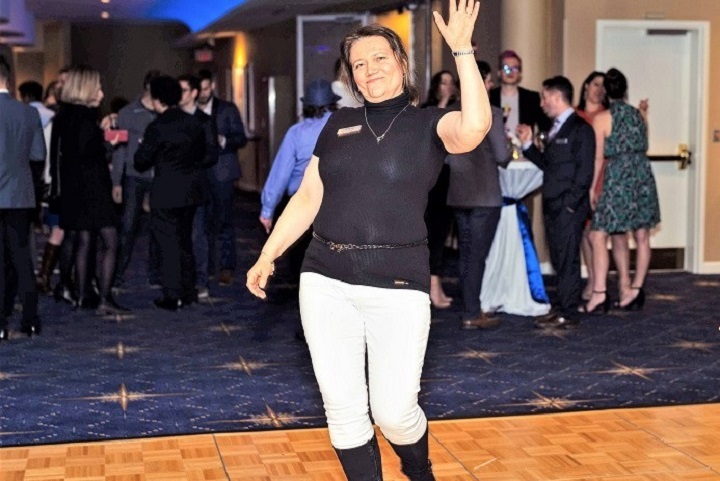 The closing ceremony has become a great annual gala where everyone dresses up for an evening of awards, speeches, dining, dancing and relaxing chess! The Godfather of chess Rex Sinquefield and wife Jeanne would open the awards ceremony. Local officials and US Chess representatives would also speak. First the runner ups and then each of our new champions, Hikaru Nakamura and Jennifer Yu. 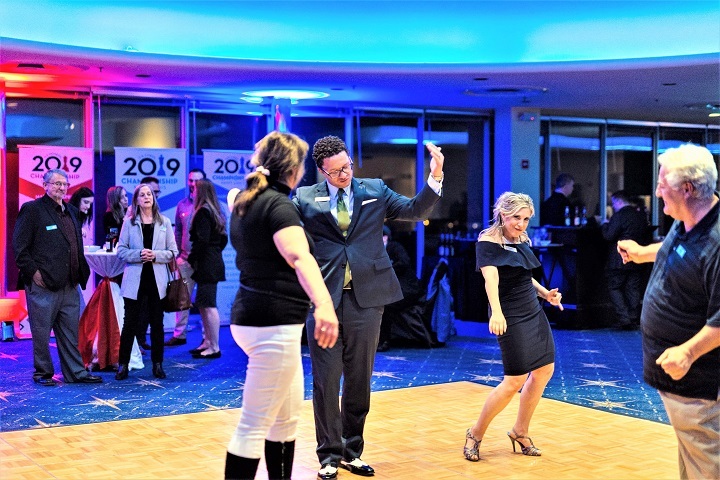 Brian Wall and Elena Novik cutting a rug, while GM Varuzhan Akobian dances with his daughter. Afterward many were seeking pictures with the new champions, including the latest Hall of Fame inductee Susan Polgar. Then onto the dance floor where a DJ kept the party going late into the night. Regulars on the dance floor included our very own Brian & Elena who are pretty good dancers. Chess boards were set up everywhere for play or kibitzing of some of the great players. The party would end upstairs but continue on elsewhere late into the early morning hours. Then Brian, Elena, and I caught an insanely early flight back to Denver. Hall of Fame inductee, GM Susan Polgar, with John Brezina. "The first time John Brezina took me to the Saint Louis Chess Club to watch the 2015 Sinquefield Cup I was in awe. I could barely speak to the World Champions and Super Grandmasters in the autograph line. I stood for 4 hours a few feet away transfixed as Topalov sprang a novelty on Magnus Carlsen and beat him. Brian Wall is dwarfed by the worlds largest chess piece. When John Brezina took me to the recently concluded U.S. Championship in Saint Louis I was more relaxed. It took me a while to get used to a sleeper couch in a bed and breakfast, I walked like a King Crab the first day. I did not feel like standing for four hours so I went to the King's Diner where GMs Alejandro Ramirez and Eric Hansen did analysis for the crowd. I soon realized that Eric saw everything I did and more, Alejandro Ramirez saw everything Eric saw and more. It took me two days to come up with a single suggestion they didn't laugh at and refute instantly. WGM Tatev Abrahamyan qualified for the World Cup. After the Women's tournament, Alejandro helped his girlfriend Tatev Abrahamyan figure out if she qualified for the World Cup. "What, I didn't know I was playing for that!?" -Tatev. "Yes, this year is a qualifier. The first tiebreaks is head to head." - Alejandro. "Oh darn, I was White."-Tatev. "That doesn't matter, you drew. The second tiebreaks is number of Blacks, you both had 5. The third tiebreaks is the Coi method. "- Alejandro. "What the hell is that?" -Tatev. "How you did against people who broke even or had a plus score. "- Alejandro. It turned out it was still in the air depending on games still going, but eventually, Tatev qualified for the next World Cup. "I am going to make you go! "- Alejandro. "It's sounding worse all the time." -Tatev. Last years U.S. Champion, GM Sam Shankland, observing ongoing games. GM Shankland signed his book for me, Yasser Seirawan signed the "Stress of Chess" by Walter Browne since he wrote the foreword. Walter had given a simul in Saint Louis before he died and also signed the book. John Brezina grabbed a copy when he heard that. Yaz is always warm, friendly, smooth and cool. John Brezina, Dwight Sehler, Timur Gareyev and I played pool together. After Hikaru Nakamura won the US Championship, he lost the best game of pool Dwight Sehler ever played. Every amazing shot went in. Hikaru got in his ride to go home, then raced back to shake hands with Brezina and Sehler, then raced back to his Uber limo. Dwight Sehler absorbing the vibe of all the brain power just a few feet away. At the closing ceremony, there was a small wooden rectangle for dancing with a DJ playing great tunes. All the women were lined up in pretty dresses, they had spent weeks choosing, waiting to dance. The men were lined up along the edges obliviously playing blitz. After an hour I couldn't take it anymore. I was very self-conscious at first, 64 years old, 300 pounds and could barely breathe right. Somehow after a few drinks, I didn't care anymore and danced with all the women. They called me the luckiest man alive. I told Chris Peterson I asked 17-year-old Jennifer Yu for the honor of dancing with the US Women's Champion. Chris replied with this quip: "Whoa, slow down there, Joe Biden!" Brian and Elena doing the bump and grind on the dance floor. While Timur drank and danced and played pool I tried to look up Lenier Domingez games to help Timur in the last round. The Dominguez games were so impressive I stopped after a while. I had to agree with Nakamura's 80% prediction but Timur surprised everybody. At one point I was sitting in a big comfy green chair watching Nakamura win the US Championship. Hikaru still remembers our draw 15 years ago with Rook and knight-pawn vs. Rook. It was surreal, like the US Championship coming through my TV screen into my living room. ... and here schooling Tony, the guy who had kindly delivered 40 White Castle burgers to the bar. Was nice of him. John Brezina was hilariously funny this trip, he knows my foibles so well now he teases me like a brother. John and Dwight helped me pick out closing ceremony clothes from Goodwill and Salvation Army. I was quite shocked I could find any pants that could fit me without any obvious connection to the circus. I met Tony, from Kansas City, who had kindly delivered 40 White Castle burgers to the bar. Later John, Dwight and I handed over a bag to some homeless guys sleeping in a storefront. The latest exhibit at the Chess Hall of Fame. 80 years of US chess on display. John Brezina works for United Airlines, and we flew standby to St. Louis together. Dwight Sehler and Elena Novik arrived on a later flight. We all ended up on the same flight going home Tuesday morning, at 5 am. Before that, we all visited the Chess Hall of Fame together"
Sure sounds like they all had a great time. Kids in a candy store :-) It cannot be denied that the St. Louis Chess Club the candy store of American chess. Elena Novik dancing and having a good time in St. Louis. As always, thanks to John Brezina for the report and his outstanding photography. And thanks to Brian Wall, Mr. Colorado Chess, for his contribution to this report.